Enterprise Mobility is the process of making a company capable of mobility. With increased flexibility and responsiveness, companies are able to move between locations, target markets and business opportunities quickly and efficiently. The use of Enterprise Mobility enhances the productivity and customer responsiveness of any company by providing up-to-the-minute information. Embrace the phenomenon of bringing your own device, allowing your employees to communicate on the device they choose. This enables your employees to be comfortable with their technology, as well as have it with them at all times – whether at home, traveling or with a customer. It works on any network, enabling all employees to be in touch with the office at all times. With Enterprise Mobility, there is no costly investment or equipment to consider. All employees can have their own devices, which are typically hand-held, making it easy for them to travel just about anywhere and still stay in touch. Companies that utilize this technology often see a significant return on investment by providing employees with timely information around the clock, giving many sales and marketing professionals the edge over their competition. 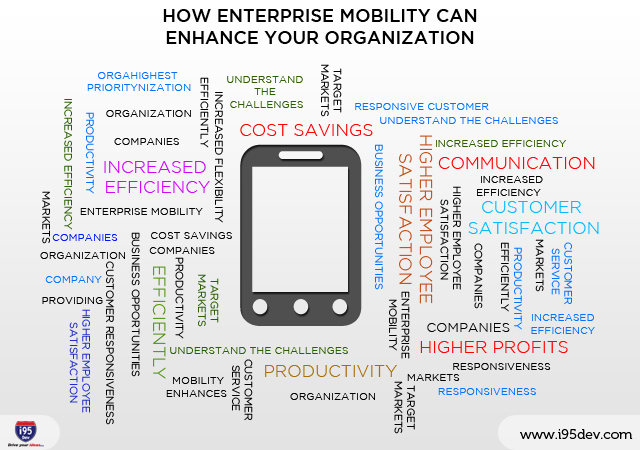 There are many benefits of implementing Enterprise Mobility at your organization, of which the highest priority is increased efficiency and productivity. Efficiency is the name of the game in the corporate world. With the ability to have a workforce that is informed in real-time, it reduces the need for back-and-forth communication, as well as errors or untimely delays in responses to the customer. In addition, the decreased need for extensive amounts of paperwork, as well as the elimination of the need to be in the office allows employees to realize greater productivity. With around the clock access to important information, they are able to work remotely and always have access to information while out in the field. The increased number of apps that are available to consumers has caused a problem with many employees who are not as informed as their consumers. When employees have real-time access to all pertinent information, including inventory, scheduling, shipping and other pertinent product information, employees can become more responsive and produce efficient results. This helps to increase employee satisfaction, which turns into higher customer satisfaction. Increased efficiency and productivity combined with reduced paperwork and more responsive customer service can create an increase in revenue. Even though there is an up-front investment, the future monetary results can off-set the initial investment. With the influx of a mobile enterprise come a few challenges. The most difficult challenge is the one the IT department faces when they have to support and determine the security of a large number of mobile devices, each coming from its own origin. In addition, the leaders of the organization need to compile a sure-fire way to handle the strategy and operations, ensuring everyone is always on the same page. Businesses are quickly adapting to the benefits of Enterprise Mobility. The productivity and cost savings make it a profitable endeavor to undergo. It enables businesses to forgo the 9-5 business model and gives employees more freedom to be out in the field and able to stay in contact with all pertinent information.